Banking on our enriched industry experience, we are engaged in offering a huge gamut of Marble Lantern. We offer superfine quality lantern with mughlai painting work. 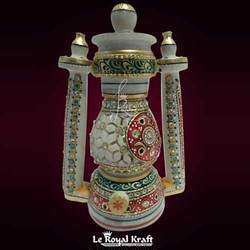 Our company is considered as a specialist in offering This quality assureds Marble Lanterns are manufactured using superior grade raw materials that are procured form reliable vendors of the industry. Fine Marble Lalten, made by marble with light. We are known as one of the most leading and trusted manufacturers and suppliers of a very fine quality and premium range of marble handicrafts. 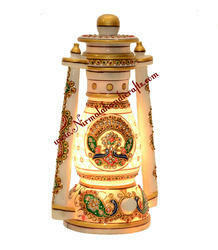 Superfine quality lantern with mughlai painting work. A piece of marble artifact with a colorful appeal excited by the prominent work of art combines the beauty of miniature painting and brilliance of gold.